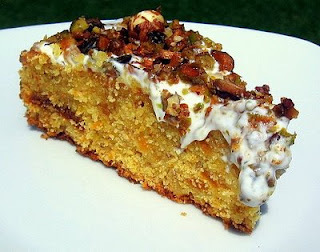 This recipe is for Peter over at Kalofagas - Greek Food & Beyond. 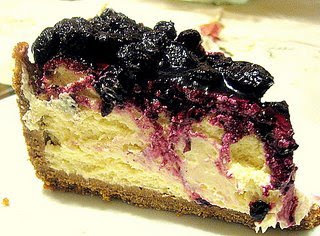 and my personal favourite, the Ultimate Cheesecake. 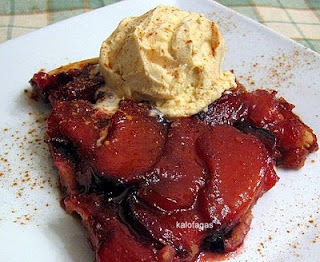 Peter made this tatin with an almond pie crust, instead of puff pastry and it worked out a treat. The plums looks beautifully unctuous and you can just imagine how good they tasted alongside that almond base, but the piece de resistance is the cinnamon ice cream that Peter had the genius to serve with this tarte! Peter doesn't have an ice cream maker, so he mashed some vanilla ice cream up with some cinnamon. Fabulous! 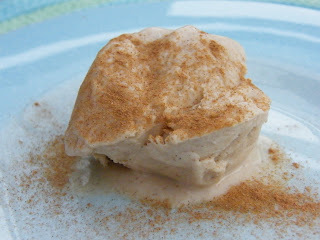 So, just in case Peter succumbs and buys an ice cream maker, I have made for him, cinnamon ice cream from scratch. It is just so good that you have to try it, even if you don't make it from scratch, then whip out that tub of vanilla in the freezer and mash in some cinnamon. You won't be disappointed. It is a delicious, warm and spicy ice cream. The best I have tasted this year! 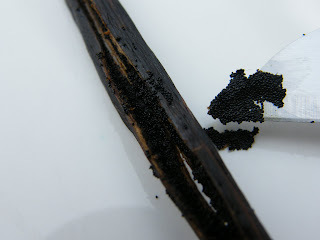 Cut the vanilla pod in half and scrape out the seeds. Heat the milk with the pod, seeds and extract. Do not allow to boil. Leave to stand for half and hour. 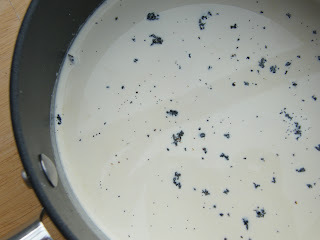 This will allow the vanilla to infuse into the milk. 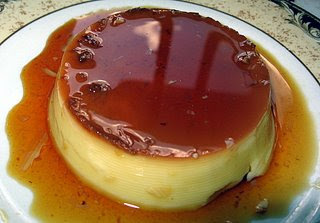 Whisk the eggs, sugar adn salt until pale and creamy. Add the milk, after removing the pod. Heat gently and whisk until the mixture had thickened. Whisk in the cinnamon. Taste at this stage, to see if you would like to add more cinnamon. Whisk up in your ice cream maker. Remove when velvety smooth. I think it is best served at this point with an extra sprinkle of cinnamon. Holler, you've given me all the motivation finally get myself an ice cream machine. I'm delighted that you enjoyed the cinnamon ice cream and I thank you for the very kind post. I'm humbled and all I can say is thank you, thank you! PS Saw your comment on my blog--aww, wish I could whip up a batch for you! I my, what a decadent post! Everything looks beyond fantastic. Cinnamon ice cream is one of my most favorite things. Cinnamon ice cream does sound good! Ive never tired cinnamon ice cream but a colleague from work always makes it. Will have to get out the ice cream maker and give it a go. Actually, I'm thinking of all sorts of things that would only be made better by a scoop of cinnamon cream! How delicious! My ice-cream maker hasn't been out at all since Spring due to the poor summer. But this would be great with lots of autumnal puds - particularly all those wonderful apples we have in the UK. Yum. All the desserts looks amazing, but the cinnamon ice cream looks absolutely scrumptious! Delightful Holler. What a nice post. Peter should make more desserts! I'm drooling just looking at these lovely photos. Peter is wise not to have too many desserts on his blog. A person can't stay svelt for the Greek beaches with eating too many. 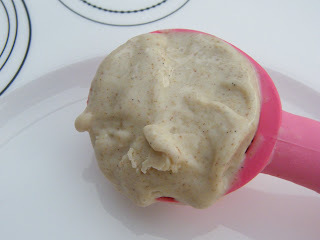 This from scratch cinnamon icecream sounds fabulous...so I am tempted!!! Just looking at that plum tatin, I've decided that is what we are going to have after our Sunday lunch! Holler, another reason for me to buy an ice cream maker, if only my kitchen was a bit bigger and I had a decent freezer. Hi Peter, I hope you do get an ice cream maker. It is a good buy. Ice cream, frozen yoghurt, sorbet, slushy cocktails, mmmmmmm! Let me know if you try it Ricki. Hi Diann, You have discovered cinnamon ice cream already. It is delicious isn't it? I don't know why I didn't think of it before Peter told us about it. You are so right Lo, this ice cream would be lovely with apple pie. It does look like an utterly delicious tatin doesn't it David? It is a gorgeous line up of desserts Flower. I would happily tuck into one of them right now! Hi Silvie, you can get all sizes of ice cream makers now. Just look about for a little one. Oh wow! Is Peter married....does he want to be? i had been so busy. Not enough time to visit the various blogs including yours which i like very much. Loved the cinnamon ice cream. what a lovely thing to prepare for someone. Is that is a proposal CC? If so I hope you are down on one knee LOL! And I thought I was the only food blogger left without an ice cream machine. I love the idea of swirling the cinnamon into vanilla anyway. Wow! Cinnamon ice cream...I love everything connected to cinnamon! What a great idea. I will be trying your recipe..can imagine what it would taste like on apple pie? Yum. This looks awesome! I have a cinnamon lover in the house and he might just love this too. Thanks so much for joining us at the Ice cream social. I love all of the recipes people have shared. Also it seems that there is a certain level of passion involved with making ice creaming. Nobody does it halfway! I found you through the Ice Cream Social and I am so glad I did! In the Southern states of America, one of our traditional desserts is peach cobbler and it would be heavenly served with your cinnamon ice cream. BUT, I also see yours is a vegetarian food blog. While I'm not a vegetarian I do love vegetarian cuisine and it makes up quite a bit more than 50% of my diet. I see you do a monthly soup and salad event and I would love to share some of my soup recipes with you. I'll be back to find out more info. Cinnamon ice cream is awesome! Thanks for the recipe! I'll be trying it!